DURHAM, N.C.--(BUSINESS WIRE)--Burt’s Bees®, a leading provider of personal care products committed to natural health and beauty solutions, today announced that the Journal of Drugs in Dermatology (JDD) published clinical data supporting the efficacy of Burt’s Bees nature-based sensitive skin regimen at maintaining healthy skin barrier function. 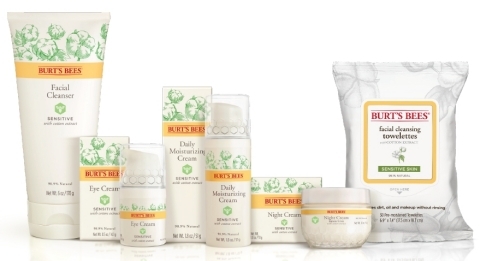 Burt’s Bees’ nature-based regimen, consisting of Sensitive Facial Cleanser, Sensitive Daily Moisturizing Cream and Sensitive Night Cream, was shown to be well-tolerated, as well as clinically, and statistically, superior to the control, a leading dermatologist-recommended synthetic regimen. This 4-week, double-blind, randomized study was conducted in 120 women with sensitive skin who suffer from clinically diagnosed rosacea, atopic dermatitis/eczema, or cosmetic intolerance. Results demonstrated that Burt’s Bees Sensitive Skin Regimen clinically and statistically improved physician-rated overall skin appearance by 34% with similar improvements in visual and tactile smoothness, clarity and radiance. In contrast, the maximum improvement in women using the synthetic regimen was 4%. About the Study: A participant- and investigator –blinded, controlled product, single site study was performed in an outpatient setting on one hundred and twenty female subjects, 19-60 years old, with Fitzpatrick skin types I-V. All subjects were diagnosed with either: eczema/atopic dermatitis, rosacea, or cosmetic intolerance syndrome. The evaluation was performed at baseline, 2 and 4 weeks of twice daily randomized treatment with Burt’s Bees Skin Care Regimen or a leading conventional skin care brand regimen. The Burt’s Bees Skin Care Regimen included Burt’s Bees Sensitive Facial Cleanser (used day and night), Burt’s Bees Sensitive Daily Moisturizing Cream (used in the day) and Burt’s Bees Sensitive Night Cream (used at night). The Control Skin Care Regimen included a leading conventional brand Skin Cleanser (used day and night) and a leading conventional brand Moisturizing Lotion (used day and night). The peer review article is entitled: “Evaluation of the Performance of a Nature-Based Sensitive Skin Regimen in Subjects with Clinically Diagnosed Sensitive Skin” [Draelos ZD, Levy SB, Lutario C, Gunt H. J Drugs Dermatol. 2018; 17(8): 611-616]. Burt’s Bees® today announced its clinical data supporting the efficacy of Burt’s Bees nature-based sensitive skin has been published in JDD.